West Ham moved back to within four points of the Champions League places after consigning relegation-threatened Hull to a third consecutive defeat. Steve Bruce's injury-ravaged Hull had the better of the first half but were badly exposed after the break. Andy Carroll prodded in after Allan McGregor pushed out Enner Valencia's shot and a cute Morgan Amalfitano dink from Valencia's pass doubled the lead. Stewart Downing then rolled in a third after Alex Song split the Hull defence. After four games without a win since Christmas, the victory revives Sam Allardyce's hopes of earning the club a first appearance in continental competition since 2006. But for Hull, a sixth defeat in eight games heightens concerns about their top-flight status. Bruce's side, who are in 18th place, are just one point adrift of Sunderland and Burnley but the manner in which they capitulated after a promising first half was alarming. Another worry ahead of their next match - the 31 January visit of Newcastle - is that James Chester and Alex Bruce have joined an already lengthy injury list. A further concern will be the fact Hull have failed to score in six of their last eight games. 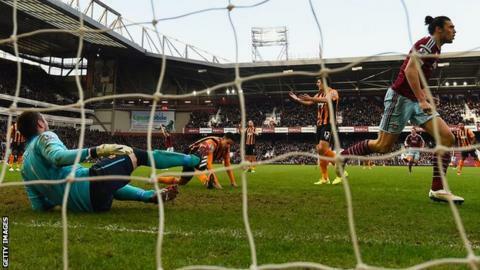 Ahmed Elmohamady spurned their best chance against West Ham, dragging a shot wide from 12 yards out after being picked out by lone striker Sone Aluko. West Ham were equally impotent before the break. They forced McGregor into action on just one occasion, the Scotland international having to tip a looping Valencia header on to the bar before smothering James Tomkins' header after the ball was not cleared. But the hosts seized command four minutes after the interval when McGregor could only parry Valencia's fierce drive and Carroll reacted quickest to jab in the loose ball. The concession spooked the visitors and their haphazard defending was exposed by two goals inside three minutes midway though the half. First Hull defender Michael Dawson dropped off Valencia 30 yards out, allowing the Ecuadorian striker to turn and feed Amalfitano, who caressed a finish over McGregor. Then on-loan Barcelona midfielder Song eliminated the Hull midfield and defence with one pass, allowing Downing to canter through and slip past the goalkeeper. The final 18 minutes then became a procession as West Ham secured the win that keeps them in seventh place. Match ends, West Ham United 3, Hull City 0. Second Half ends, West Ham United 3, Hull City 0. Joey O'Brien (West Ham United) wins a free kick in the defensive half. Attempt missed. Tom Huddlestone (Hull City) right footed shot from outside the box misses to the left. Corner, West Ham United. Conceded by Ahmed Elmohamady. Kevin Nolan (West Ham United) hits the right post with a right footed shot from the right side of the six yard box. Assisted by Stewart Downing with a through ball. Attempt saved. Jake Livermore (Hull City) right footed shot from outside the box is saved in the centre of the goal. Assisted by David Meyler. Attempt blocked. Sone Aluko (Hull City) left footed shot from outside the box is blocked. Assisted by Jake Livermore. Attempt blocked. Morgan Amalfitano (West Ham United) right footed shot from very close range is blocked. Assisted by Kevin Nolan with a headed pass. Attempt blocked. Stewart Downing (West Ham United) left footed shot from outside the box is blocked. Assisted by Carl Jenkinson. Substitution, West Ham United. Joey O'Brien replaces James Tomkins because of an injury. Morgan Amalfitano (West Ham United) wins a free kick on the right wing. Attempt saved. Stephen Quinn (Hull City) left footed shot from the right side of the box is saved in the bottom left corner. Assisted by Yannick Sagbo. Goal! West Ham United 3, Hull City 0. Stewart Downing (West Ham United) left footed shot from the centre of the box to the bottom right corner. Assisted by Alexandre Song with a through ball. Substitution, Hull City. Yannick Sagbo replaces Curtis Davies. Attempt missed. Tom Huddlestone (Hull City) right footed shot from the right side of the box misses to the left. Assisted by Ahmed Elmohamady. Goal! West Ham United 2, Hull City 0. Morgan Amalfitano (West Ham United) right footed shot from the centre of the box to the centre of the goal. Assisted by Enner Valencia. Attempt missed. Enner Valencia (West Ham United) left footed shot from the left side of the box is close, but misses to the left. Substitution, West Ham United. Morgan Amalfitano replaces Mark Noble. Corner, Hull City. Conceded by Alexandre Song. Offside, West Ham United. Alexandre Song tries a through ball, but Enner Valencia is caught offside.